India were restricted to 254/9 chasing a target of 289 in Sydney and Australia take a 1-0 lead in the three-match series. 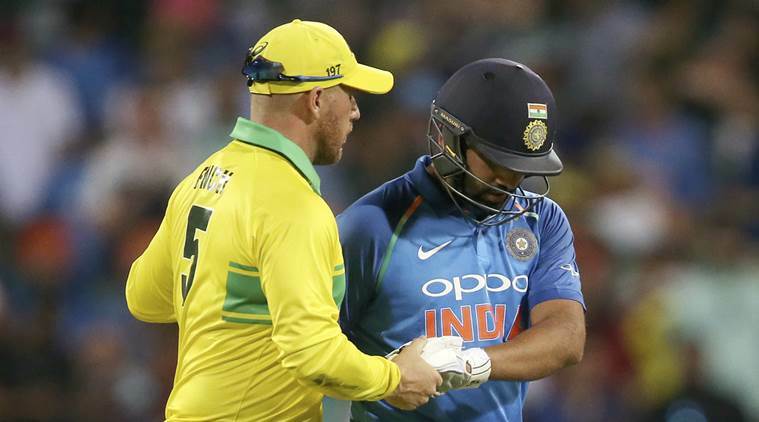 Australia beat India by 34 runs in the first ODI played between the two sides as part of a three-match series in Sydney. Chasing a target of 289 runs, India were restricted to 254/9 The defeat came despite a marathon 129-ball 133 from vice-captain Rohit Sharma. He and MS Dhoni shared a 137-run fourth-wicket partnership after Jason Behrendorff and Jhye Richardson blew away India’s mighty top order within the first four overs. Australia had won the toss and chose to bat first. While they lost captain Aaron Finch and his fellow opener Alex Carrey early, the middle order got partnerships that crossed the 50-run mark. Shaun Marsh, who was one of three middle-order batsmen who scored half-centuries, said that the wicket was slower than what seemed to be the case earlier. Marsh and Usman Khawaja put up 92 for the third wicket and then 53 with Peter Handscomb for the fourth. Handscomb then put up 68 for the fifth wicket with Marcus Stoinis. Australia were 288/5 at the end of their 50 overs and it looked like a below par score against a batting side of India’s caliber. But Jason Behrendorff and Jhye Richardson had other ideas. Behrendorff caught Shikhar Dhawan plumb in front of the stumps in the very first over of the match and his ODI career. Richardson went on to take the wicket of Virat Kohli and then Ambati Rayudu in the same over and that meant India had lost their mighty top order within the first four overs of the match. While Rohit and Dhoni stemmed the flow of wickets, they also struggled to score runs as the required rate kept climbing on India. Both players reached half-centuries but MS Dhoni did not last long after reaching the milestone. He was dismissed for 51 which he made off 96 deliveries. With 10 fours and six sixes, Sharma reached his hundred off 110 balls, equalling Sourav Ganguly’s record of 22 ODI centuries and is now behind only Sachin Tendulkar (49) and Virat Kohli (38). He then started to accelerate but was running out of partners at the other end. Dinesh Karthik and Ravindra Jadeja were the only recognised batsmen after Dhoni and they were dismissed for 12 and eight respectively. Rohit eventually fell and that virtually ended the Indian challenge. Bhuvneshwar Kumar went on to score a few runs and Mohammed Shami’s wicket was the final act of the match.